At the end of 2016, the Australian Bureau of Statistics (ABS) revealed that close to two-thirds of all Australians had completed a degree or apprenticeship. 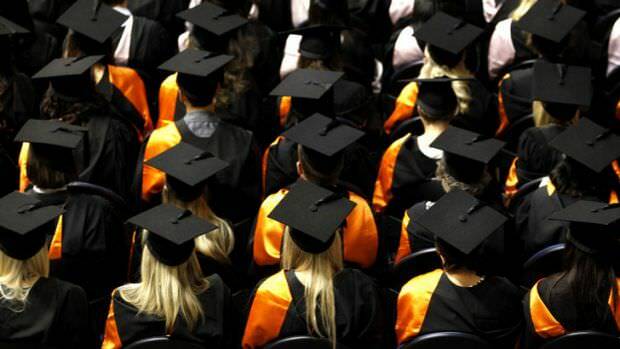 The growth in the number of people attending a university or TAFE has risen out of a cyclical demand-driven system called “academic inflation”. Think supply and demand. If an employer can hire someone with a degree or someone without, they’ll hire the person with a degree because they are seen as the superior candidate. This puts pressure on everyone to get degrees. But once everyone has one, the value of having a degree goes down. A couple of decades ago, a high school diploma was sufficient to get a job in journalism or business. Now a bachelor’s degree is required. Where a bachelor’s degree was sufficient to get a job in research, now a master’s degree is required. Where a master’s degree was sufficient to get a job in university tutoring, now a PhD is required. The number of people gaining master’s degrees has doubled from the early 1980s to the late 2000s. The PhD, once a niche qualification for the few, has become the definitive qualification of what it means to be an expert today. For a young millennial, this means they might have to study three to six years longer than their parents did to get the same job. That’s three to six years of debt, without any increase in wages at the end of it. If that job requires only basic skills such as photocopying or research, then the millennial will not necessarily have any greater skills than their parents had with a high school diploma in the 1970s. This is borne out by data from the US, showing that in 1973 only 28% of jobs required a degree, compared to 59% in 2008. When companies demand more and more degrees for very basic jobs, they cut off access for unskilled workers to break into the job market. In many professions, the traditional route into a job was through an apprenticeship, which required no professional training or degree, no private tuition or cost on behalf of the student. Even a degree like law, which is today seen as a prestigious qualification, used to be taught exclusively by students apprenticing in legal offices. The cost was borne out by the business, rather than the student, meaning students could come from a variety of backgrounds, including former convicts. As a result, universities are increasingly being blamed for cementing privilege, by entrenching the positions of the wealthy in the job market, as those with the most access to degrees. In response to concern over diversity and equality of access and opportunity, top firms including Ernst & Young and Penguin Random House have recently abandoned degree requirements altogether. Ernst & Young got rid of all degree requirements in 2015, explaining that a candidate’s degree had no correlation to their future job performance. A year later, Penguin Random House followed suit, citing the need to hire applicants from more diverse backgrounds. PriceWaterhouseCoopers, Ogilvy Group, Apple and Google have all relaxed their degree requirements in recent years, lowering required grades or targeting poor performing and non-college students. The idea is to hire people based on merit, rather than credentials, often by assessing candidates with psychometric testing or other performance based tests. Instead of abandoning degree requirements altogether, some firms, including professional services firm Deloitte, have chosen to hide which university an applicant graduated from. The aim is to limit the “prestige” associated with an institution, so as to more accurately test the abilities of the applicant. What matters in both this and the broader debate is a refocus on ability over credentials. That some companies are relaxing degree requirements raises new questions about the value of a university education. The question is whether these few companies are outliers or the forerunners of a new trend of preferencing merit over qualifications. If the trend does persist, then the job market of the future may have as little barriers to entry as the job market of the 1970s. Joshua Krook is a Doctoral Candidate in Law, at the University of Adelaide. Based on personal (perhaps limited) experience I am not surprised by these findings. Companies are more than happy to outsource training and experience to universities, who in turn charge students for the ‘privilege’ of being able to get a foot in the door for a job that a child could do with a fair degree of competence. What is particularly sad is the total lack of serious discussion about this issue. It seems blatantly obvious that the more people undertaking tertiary study (a form of education that set people apart from the rest of the workforce), the less value this level of qualification has to employers. When there’s a dime-a-dozen law graduates available to do even the simplest of tasks in a legal firm, why provide your employees with effective training, or mentoring, or career opportunities, or (in some cases) a decent wage? Despite what to me seems like an obvious long-term problem, since the 1980s our leaders (mostly from the ALP) have turned a blind eye to this challenge. Rather than find some means of harnessing the intellectual potential of the many graduates of higher education, the response appears to have been to crow about how smart our nation is and pretend that most of the workforce utilises their brainpower. Rather than encourage (or mandate) companies to train and upskill graduates to do more advanced tasks, the government has instead kowtowed to business, letting them hire foreign workers from overseas to perform work that, with a bit of training and patience, could be filled by domestic graduates who are finding it increasingly more difficult to find a job suitable for their qualifications. Malcolm Turnbull has come out promising to curb 457 visas, but does anyone really believe that the changes will be anything more than symbolic? To reduce dependence on foreign skilled workers requires putting a lot more funding and resources into local graduates and those on the lower rungs of the workforce. Sadly, that’s a bit too much of a challenge for this generation of leaders, especially when means admitting that 30 years of promises about the benefits of a more educated workforce were, at best, a gross misrepresentation of reality, and at worst, a malicious lie for the benefit of the political classes and their funders. Interesting if it is in fact a vanguard approach. The danger lies in placing no value on discipline and curiosity. The psychometric testing needs to be heavily laced with predictive analytics or it will give false positives. Let’s try new approaches though and see which mix works best. Here in the US, the insanity of credentialing extends far down the food chain. For example, in 1970 every hospital used to hire and train its own orderlies, nurse’s aids and clericals and all the teaching hospitals used to operate their own three year registered nursing schools and 12-18 month licensed practical nurse programs. Now, that is all gone. State and private post-secondary schools now offer one or two year programs that graduate certified nurse’s aids/orderlies, licensed practical nurses and certified medical office or billing technicians. The graduates of these programs typically go looking for their first job after having accrued $10-15,000 of student loan debt. Three year hospital trained registered nurses are a thing of the past. Hospitals now require that native born nurses have a BA or BS in nursing to enter the field and an MA or even PhD for any supervisory position. These nurses have typically accrued $20-30,000 of student loan debt by the time they have graduated. At the same time, the same hospitals eagerly hire foreign nurses with only hospital training in their native country. The article is pure fantasy if Joshua Krook imagines that companies are jettisoning credentials in order to hire on merit. They are jettisoning credentials for the same reason American colleges are jettisoning standardized tests for admissions: they are both barriers to the Prime Directive which, these days, is diversity. Standardized tests are a barrier to diversity in admissions to college, and four (or five or six) years later, credentials are a barrier to diversity in hiring. I’m baffled by the stat for jobs requiring a ‘degree’ in the US in ’73 compared to today. The percent of the population with a college degree was approx. 10% in ’73 and reached 25% in 2000. That’s less than half the # of jobs requiring a degree in the stat you cite.